Siddhartha Gautama was the son of King Suddhodana of a tribe that lived in the city of "Kapilavastu" in the foothills of the Himalayan Mountains in today's Nepal. He was born more than 2,500 years ago sometime in the sixth century B.C., probably before 567. From that point on the legend takes over. All great heroes are surrounded by legends that obscure the facts of their lives, and the Buddha is no exception. Under the legends lie a few historical facts known to be true. It is for that reason that the many stories about the Buddha's life should not be taken literally, but rather as helpful Buddhist teachings. As the son of a rich nobleman, he lived in royal manner. He had the run of three palaces, the entertainment of 40,000 dancing girls and a herd of elephants decked in silver ornaments. He is said to have been handsome, a fine student and a skilled athlete. At 16 he married a highborn lady whom he won by feats of prowess at a contest. But while still in his twenties, he was apparently stirred by a sort of divine discontent. No factual history tells how Gautama came to assume a religious calling, but the legends of the Four Signs grew to explain his undertaking. Five days after his birth, the legend says, soothsayers predicted that the boy would be a Universal Emperor unless he were summoned to become a Universal Teacher by four signs, which would reveal to him the misery of the world. These alternatives permitted only one choice to Gautama's father, a worldly and aristocratic man, who determined that the prince should see no human sorrow and ordered the royal parks cleared of the sick and destitute. But the gods arranged that one day, while riding through the grounds, Gautama should come upon a bent and decrepit old man. He asked his charioteer what this creature was, and from the answer he learned that all men age. The First Sign of the prophecy had been fulfilled. Not long afterward, on another ride through the park, Gautama saw a man disfigured with sores and trembling with ague; from this encounter, the Second Sign, he learned that men suffer sickness. The Third Sign was a dead man, this taught him the fact of death. The Fourth Sign was a beggar unmistakably content although he wore nothing but a yellow garment and carried a bowl for begging food. From this last sign, Gautama learned that men could find peace in withdrawing from the world, and he understood that this was to be his own destiny. Not long afterward he slipped away from home in the middle of the night, biding only a silent farewell to his sleeping family because he feared he would not be able to leave his wife and newborn child if they were awake and smiling at him. Attended by his charioteer he galloped away from the palace. Nearing a forest, he took off his princely robes and put on some beggarly rags. Then he sent his charioteer back to the palace with locks of his hair as trinkets for his family. Gautama began his attempt to discover "the realm of life in which there is neither age nor death" when he was 29. He approached the task in the traditional way - by going to sit at the feet of a guru, a learned teacher who taught the wisdoms of the "Upanishads". The Upanishads are a collection of philosophical speculations that begun about 700 B.C. They contained many of the themes that inspired the originators of Jainism and Buddhism, and provided the religious foundation for Hinduism. The name comes from two Sanskrit words, "upa", meaning "near", and "shad", "to sit", because the Upanishads, developed before writing was common in India, were passed on orally by sages to pupils sitting nearby. The Upanishads probe into the nature of the universe and the human soul, and the relation of each to the other. They make no absolute statements of right and wrong, of creation, the gods or man; instead they speculate, seeking always to find truth, as opposed to stating it, and offering a wide range of possibilities. But the Upanishads set the tome for all further religious development in India, and in this they are the most sacred of literature. But the teachings failed to satisfy Gautama, and he left the guru to try another traditional way of finding salvation, the life of austerity. Joining a band of five ascetics, he retreated to a forest, where he outdid his companions in the rigors he imposed on himself. He ate only a single bean a day and eventually grew so thin that he said he could touch his spine when he put his hand on his stomach. After six years of this regimen he collapsed one day and revived only when a village maiden happened along and gave him some gruel to eat. When he recovered sufficiently for reflection, the idea came to him that without the use of his body he could hardly use his head to gain enlightenment; severe self-denial was not the path to the knowledge that he was seeking. His fellow-ascetics gave him up as a reprobate, and Gautama turned to solitary and meditation. This time, determined to succeed, he settled himself under a fig tree outside the town of Gaya, near Banaras, and resolved not to rise until he understood the mystery of life. After Gautama sat beneath the tree for 49 days, he awakened from a trance to see the condition of mankind with clarity. Thus he became known as the Buddha, the "Enlightened One". 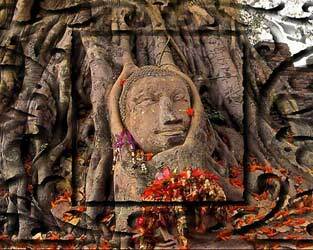 For another 49 days he remained under the fig tree, which is also called the Bodhi tree or "Wisdom" tree. The Buddha kept pondering the riddles he had solved. He then set out for the holy city of Banaras to teach what he had learned. In a park outside the city he delivered his first sermon. His only audience was the band of five ascetics who had abandoned him before; they turned to him now as rapt disciples. The sermon was to become one of the most celebrated in the history of religion. In this sermon the Buddha proclaimed the Four Noble Truths and the Eightfold Path, concepts that have remained fundamental to Buddhism, though many have changed greatly. The First Noble Truth is that life is "dukkah", a word usually translated as suffering. But in the Pali language, in which the Buddhist scriptures were first recorded, the word is applied to an axle that separates from its wheel or a bone that comes loose from its socket. In the Buddha's statement, life is out of kilter; that is why man is doomed to suffer. The Second Noble Truth is that the reason for suffering is "tanha" - a word that is usually translated as thirst or desire, but on the Buddha's terms meant specifically a craving for individual fulfillment. So long as man strives for himself he will remain dislocated from the universe at large, and he will suffer. In this the Buddha was building on an idea from the Upanishads - that every man should seek identification with all other things. The Buddha, however, did not regard this identification process as involving a universal spirit like the Brahman of the Upanishads. The Third Noble Truth is that the craving for the individuality must be overcome; and the Fourth Noble Truth is that the means for overcoming it is the Eightfold Path. The Eightfold Path, like the Ten Commandments, is a code to live by; but unlike the Commandments, which are held to be equally true and binding for all men at all times, the Path is a set of rules to be followed in ascending order; until the first step has been mastered, one cannot expect to succeed in later steps. The first step in the Eightfold Path is Right Understanding. Man must know what he is about if he is to win salvation; he must know the Four Noble Truths. The second step is Right Purpose: he must aspire to reach salvation. The third is Right Speech: he must not lie and must not commit slander, for both arise out of the will to perpetuate individuality, and thereby shut the aspirant off from salvation. The fourth is Right Behavior, toward which the Buddha offers five precepts: Do not kill; do not steal; do not lie; do not unchaste; do not drink intoxicants. The fifth is Right Means of Livelihood: one must be engaged in an occupation conducive to salvation - preferably the monastic life. The sixth is Right Effort: one must exercise will power if he would succeed. The seventh is Right Awareness: one must constantly examine one's behavior and, like a patient in psychoanalysis, trace it to the cause, trying to understand and remove the cause of misdeeds. The eight and final step on the Path is Right Meditation: one must ponder often and deeply on ultimate truth if one is to find salvation. Through the legends of the Buddha comes a picture of a world hero who is an extremely endearing and human person. On one occasion he encountered an outcaste who lived scavenging rubbish heaps in the street. The outcaste, accustomed to the rule that he remove himself from the presence of the upper castes, cowered against a wall of the nearest building. But the Buddha broke convention and spoke to the frightened creature. "Sunita," he said, "what to you is this wretched mode of living? Can you endure to leave the world?" The poor scavenger was overcome. "If such as I may become a monk of yours, may the Exalted One suffer me to come fourth." 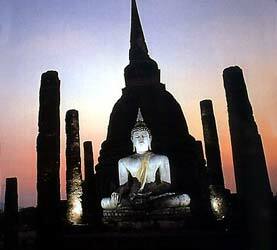 The Buddha took him into his religious order, where he excelled as a monk. On another occasion a woman approached him carrying the corpse of her only child; she beseeched the Buddha to bring the baby back to life. He asked her to bring him some mustard seed from a family in which no one had died. She searched all over, but naturally she could find no family that had never suffered death. Finally understanding the meaning of his request, she gave up the search, and then entered the Buddhist order as a nun. Several aspects of the Buddha's teachings displayed insight of astonishing power. First, he taught in the vernacular instead of the arcane Sanskrit, in which the teachings of the Upanishads were preserved, thus making religious ideas available to far more people than before. Second, he opened a path to salvation that was independent of complex rituals - anybody could follow the path, provided he exercised self-effort. Finally - and in this the Buddha stands alone among the religious leaders of the world - he refused to engage in metaphysical speculation about the universe. The result was the unique phenomenon of a religion without a god, without worship, even without a human soul. It is for that reason that Buddhism is often called a philosophy instead of a religion. The Buddha made a stunning impact on the India of his day. He made salvation available to all, independent of what caste they came from. If Buddhism was unique, as a religion without a god and without worship, it did not long remain so. During his life some of the Buddha's followers tried to deify him, a move he resisted; later their heirs succeeded. In time the Buddhism split into different sects and the major divisions came to be called the Greater and the Lesser Vehicles (vehicles because both claim to carry man to salvation). The Greater Vehicle which has the larger number of followers (some 250 million throughout Asia today), not only deify the Buddha, but supplied the metaphysical scheme he had resolutely omitted: a cosmology adorned with heavens and hells and people with saints, as well as a worship embellished with incense, candles and holy water. Oddly enough, while Buddhism spread all over the world, it eventually disappeared from India. The Buddha reached the old age of 80. He died, tradition has it, when he accepted from a pious layman a piece of pork - which he knew was spoiled but which he was too polite to refuse. He ate it, sickened and lay down in a park to die. As he performed his final meditations, he felt himself becoming free of all passions. Turning to his followers, he told them to remember that the things of the world were unreal and were subject to decay. With his last breath he commanded them: "Work out your own salvation with diligence."